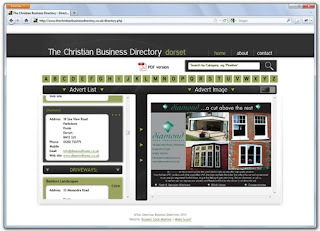 I recently worked alongside Ricardo Cook Martins on a website for The Christian Business Directory. This was an unusual project for me because I didn't handle the creative / graphical side, for once. My job instead was to write a simple CMS (Content Management System) from scratch. Agggggh was my first thought...but then I moved on. The client needed a website, to bring the adverts from their paper directory, to the web, in a dynamic user-friendly way, while being able to be updated by the client. I handled layout and concept for the directory browser, and all the code for the rest of the site, including a flash video player.